Everyone likes holidays especially New Year as any our CHERISHED dreams may come true on New Year’s Eve. And what if we offer you to celebrate this fabulous feast in… China! Yeah! Launching Happy New Year slot machine created by Microgaming company, you plunge into the marvellous festive atmosphere and get a splendid chance to win the fantastic cash prizes. Choosing this 3 reel classic online slots, you can not only enjoy yourself, but have a look at some of the special features of Chinese New Year. Play the slot machine with 5 paylines and benefit from its no download version that is also available for you whenever you like. That is why, try you hand at the slots and you won’t be sorry! As every spin can bring you pretty nice gifts. 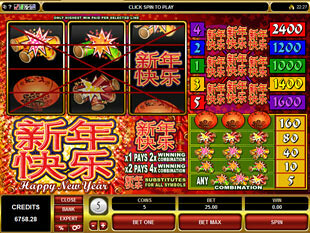 Try to hit as many Chinese Symbols of Happy New Year on the reels as possible cause they act like the wild symbols. The wilds are really powerful symbols. 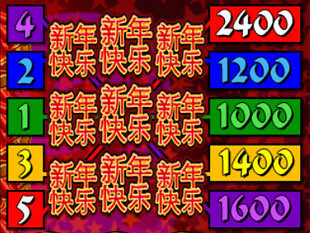 They are capable of replacing any other slots images such as Red Lanterns, Yellow Crackers, Green Crackers, Red Crackers. All of these symbols can also create diverse winning combos. Nevertheless, if you manage to replace the missing picture with the help of the wild symbol, your present will be really tempting. Chinese Symbols can double and even quadruple the winnings. Fortunate enough to catch 3 wild symbols on the 5th payline? Then, wait for the exclusive gift from Chinese Santa that is called Shengdan Laoren. What is it? Oh! You will be surprised! As the award represents the biggest holiday jackpot of $60,000. Are you still standing on your feet? Happy New Year slot machine suggests you gambling with various coin sizes. You can choose any denomination among the following ones: $1.00, $2.00, $5.00 $10.00, $20.00, $25.00. Each payline accepts 1 coin only. If you want the holiday to be a real success, you should decide which bet to opt for. Of course, you are free to adjust the minimum stake of $1.00. However, in case you desire to turn New Year’s Eve into the fancy ball of great money, we recommend you to put $125 per spin. It is the highest bet of the slots. You may catch diverse winning combinations while gambling. But, the moment you notice 3 Chinese Symbols of Happy New Year, you may jump for joy! As if these icons appear on the reels at the same time, you get the incredible festal jackpot of 2,400 coins or $60,000 instantly. Are you already itching to seize it? Then, fix the maximum bet and start spinning the reels! We are really looking forward to congratulating you with both Happy New Year and the cheerful slots awards! Willing to approach New Year party? Maybe, you wish to diversify this winter holiday and add a zest into it? Hey! Playing Happy New Year slot machine, you may implement all of that hands down. The first step is to visit one of the safe Microgaming casinos that has this game among other classic slots. Then, make one click and… The unusual New Year’s fairy-tale will come into your house and bring you the impressive and enticing presents.